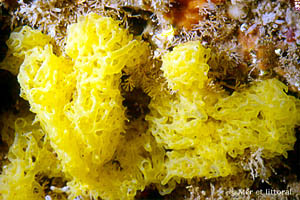 The yellow network sponge is a calcareous sponge of 10cm in diameter and forms a tangle of yellow colored tubes all interconected in a complex network. Spongin provide support for the organism. They possess no organs, but are able to draw water into their bodies through the use of ciliated cells in order to entrap food. Reproduction can either be sexual or asexual depending on environmental conditions. Can be found growing on sediments in tropical and subropical marine environments. The yellow network sponge is of little known importance to humans. "Clathrina clathrus". European Marine Life. Retrieved from: http://www.european-marine-life.org/02/clathrina-clathrus.php.